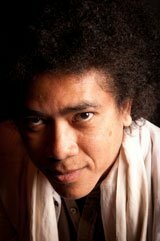 Jean-Luc Raharimanana was born in Antananarivo, the capital of Madagascar, in 1967. By 1987 he had already been awarded the Jean-Joseph Rabearivelo Poetry Prize for his early poems. Two years later he completed a degree in Literature at the university in his native city and joined a theatre group for which he wrote his first play, Le Prophète et le Président (1989; t: The Prophet and the President). The piece was awarded the Tchicaya-U’Tamsi Prize by the Inter-African theatre competition, but actual performance was forbidden by Madagascar’s governmental authorities. He published a collection of short stories, Le lépreux, in 1992. The author then went to Paris on a grant from the French foreign radio and studied at the Sorbonne and the Institut National des langues et civilisations orientales. After completing his studies he worked as a journalist and French teacher. Raharimanana’s stories are marked by a rich tension between style and content. Through lyrical, sensuous language influenced by oral tradition, the author portrays not only the beauty of nature but poverty and squalor, especially of the shanty towns. In his work, legends and old superstitions are juxtaposed with contemporary political events. He received the Grand Prix Littéraire for his short-story collection Rêves sous le linceul (1998). His first novel, Nour, 1947, was published in 2001. His work has been translated into German, English, Italian and Spanish. He lives in Paris.